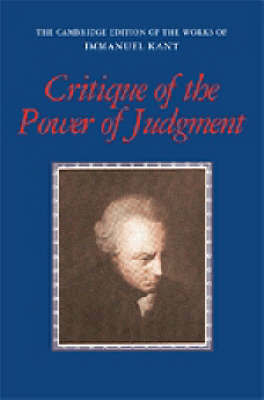 The Critique of the Power of Judgment (a more accurate rendition of what has hitherto been translated as the Critique of Judgment) is the third of Kant's great critiques following the Critique of Pure Reason and the Critique of Practical Reason. This translation of Kant's masterpiece follows the principles and high standards of all other volumes in The Cambridge Edition of the Works of Immanuel Kant. This volume, first published in 2000, includes: the indispensable first draft of Kant's introduction to the work; an English edition notes to the many differences between the first (1790) and second (1793) editions of the work; and relevant passages in Kant's anthropology lectures where he elaborated on his aesthetic views. All in all this edition offers the serious student of Kant a dramatically richer, more complete and more accurate translation.